Although it doesn't use any potions or spells, there's definitely something magicall about this Harry Potter Crest Liquid Reactive Umbrella. 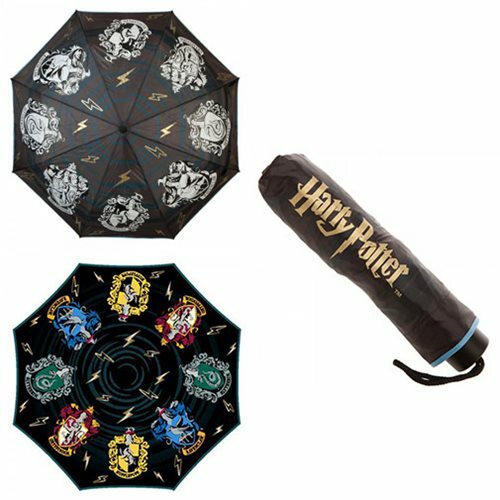 Whether you belong to Slytherin, Hufflepuff, Gryffindor, or Ravenclaw, this umbrella will have you and onlookers dazzled when it changes color in the rain. Made of a nylong canopy, a metal frama, and a plastic handle, it measures approximately 36-inches in diameter x 21-inches in height. A nylon sleeve which displays the Harry Potter logo is displayed.